Night Cap Bourbon Ready to Go! This message goes out to all the loyal Night Cappers who made it to the last Night Cap. 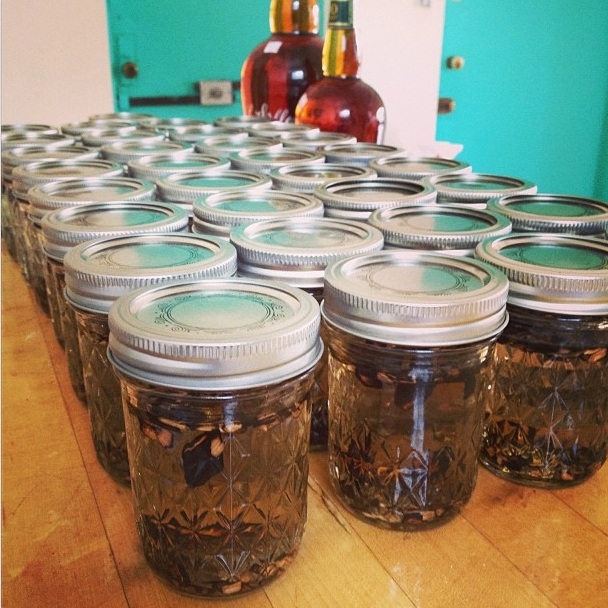 We’re coming up on 3 months since you all left with a bottle of my mason jar bourbon, and guess what: it’s time to start tasting. Nobler Mark and I have dug into our stashes already and I can tell you, the 3 month age is really damn delicious. I recommend you take a little swig and see what you think before running all of the contents through a coffee filter, just in case you want more age. But I encourage you to enjoy the “young” bourbon now. It’s a nice change of pace from the heavier commercial options and I’ll tell you, nothing kicks off a weekend better than some homemade bourbon. Hope you enjoy and hit me up if you have any questions on how to specifically filter it. Added bonus, I hope to have some news on the next Night Cap coming soon!